Just a couple of mini-musings this week, then we'll do a quick look at the upcoming Guild models. -Wyrd needs volunteers for Gencon. This is always a ton of fun, and I'm very sad I won't be able to help out this year. More room for you, though! -Just in time to be too late for my blog, here's the image of the Self-Righteous Man after Divergent Paths/in Book 5. Werewolves with top hats: always a crowd pleaser. As usual, all of these models are still being tested and are thus subject to change by the time the book finally comes out. Jury-8ss Henchman-First mentioned all the way back in the fluff from Book 1 of 1st Edition Malifaux, The Jury finally joins the Judge and Executioner in the law sub-faction of the Guild. Has some utility by allowing models within 6” to discard a card and add a mask to their duels (like if, oh, I don’t know, you wanted to Riposte for instance.) He/she/it has an interaction with the fees condition through handing it out on defensive or offensive triggers and can force you to discard a card for each point of your Fees condition with a trigger on the ranged “Throw the Book At Them” action. Finally, the Jury can find you innocent, guilty, or libel as a 0 to put some nasty conditions on enemy models or give some healing to friendly ones. Guild Investigator-6ss Minion-I’m a big fan of the idea of these guys: detectives that are investigating stuff that’s going on in Malifaux. Its attack is nothing to write home about (though at least the gun has a claw symbol so it can be used for melee.) However, it has some interesting potential in terms of denial of enemy scheme marker stuff, by eating one every turn (or a corpse or scrap marker) to draw a card, locking the enemy out of using any scheme markers near the investigator for their actions or to complete schemes, and by pushing models that are near where a scheme marker is placed. Cool. Thalarian Queller-6ss minion-For non fluff-heads, the Thalraian doctrine is one of the many magical methodologies in Malifaux, in this case one that focuses on suppressing other spellcasters and creating enchantment/long running effects. This is embodied by this model, who can toss out markers to create a sort of mobile version of the “Removes suits from Ml, Sh, Ca, Df, etc.” effect that models like Hannah have. They can enchant friendly models weapons to make their damage unreducable, which is handy, and can use a ranged attack to reduce enemy’s attacks and possibly give them slow. An interesting tech piece, but time will tell if it's useful enough to see play in most games. Monster Hunter-6ss minion-Reflecting presumably some members of the Latigo posse who also do monster hunting (how many Ortegas are there? ), these guys interact with the Stalked condition (which they can apply with a 0). In addition to the free moves generated from it, models with the condition have to discard a card to cheat fate against them, the Monster Hunter can get a free attack on them after taking a “Stalked” move, and the Monster Hunter can heal itself and draw some cards after killing a model with the condition. In addition, they deal extra damage and take less damage from models with higher soulstone costs than them. 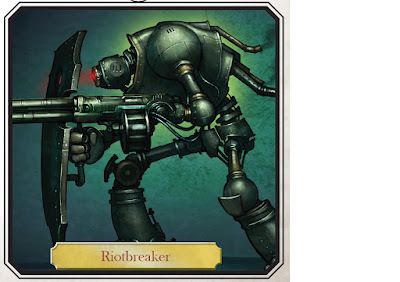 Riot Breaker-6ss Minion-So a new Guild construct that has been a minion in the Through the Breach roleplaying game for a while now (that's where the above art comes from), oddly enough, these guys seem to be peacekeeping models of some kind. They block models near them from gaining any extra AP from fast or casting expert, which could be situationally useful. They’ll probably be used mostly for their Riot Gun attack, that adds some cheap blast damage and gives models damaged by it Insignificant for the rest of the turn. Its Tactical Action seems like it could be useful for breaking up clusters of models, as a Wk duel of 13 requires a 7 or an 8 for most models to pass, but I’m personally not a huge fan of these type of abilities, as they tend to not do anything significant when I’ve tried them. Not sure on this model, but we’ll see.